You are here: Home / Ethnic Groups / The People of Sumatra / Who are the Lampung Abung? The Lampung Abung are a large group with a social structure that is strong and somewhat separate from the other Lampung peoples. The Lampung Abung are made up of three groups: Abung, Seputih and Menggala. The Lampung Abung live in the regencies of North Lampung, East Lampung, Central Lampung and Tulang Bawang. 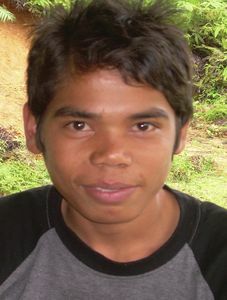 The Abung are the only group among the Lampung peoples who speak the language Lampung Nyo. There are several levels of language used for special situations, such as cultural ceremonies. Most of the Abung can also speak Indonesian. The Abung follow a cultural tradition called Pepadun, which means “seat” or “throne” as used by a ruler. The leadership system of the Abung is similar to a congregational system. There are many leaders who each have voice in cultural meetings that function much like a congress. Family ties among the Abung are very strong, as is the concept of leading by consensus among the Abung clans. Most Abung are farmers. Their homes have already tended to shift from the traditional, long wooden homes built on poles to the concrete homes built at ground level found throughout Indonesia. Usually each village has ten clans. Each clan has a leader. This position is passed down from generation to generation to the oldest son and follows a patrilineal system. When they marry, the Abung live near the husband’s family. Polygamy is permitted but is only practiced by the wealthy. Marriage between close relatives and cousins is forbidden, as is divorce. Almost all Abung people are Muslim. In principle, the Abung are not allowed to hold to any religion other than Islam. Every village has at least one mosque. If there are several neighborhoods in one village, every neighborhood will have its own mosque. The Abung hold the place of worship in high regard as they are very devout in observing the five ritual prayer times each day, fasting and reading the Qur’an. Though they are Muslims, they believe in the occult and a talisman that is used for specific purposes such as traveling and working. The most pressing need right now is improving agricultural management, especially improving the quality of pepper for export. This would help the Abung improve their standard of living. The area also needs attention from investors who can expand the industry sector because this area has had little industrial development. Besides those needs, training in the development of local businesses could help raise the economic state of the community. Unlike the older generation, those who are now young adults have little interest in working at any type of job.